Shakesphere wrote, “That which we call a rose by any other name would smell as sweet,” in a sonnet for Juliet, who argued that names are not important, but rather what something is. Well, dear Juliet, not in chemistry. Differences in terms we use interchangeably in everyday language, for example molecule versus compound, may seem trivial, but they are not. They mean different things! Elements: a substance that cannot be broken down into a similar substance by chemical means. These can be found on the periodic table. Ex. aluminum (Al), sodium, chlorine, (Cl), etc. Atom: a unit of an element; the smallest particle of an element that retains the characteristics of that element. Think of this as the element’s DNA—it’s unique identity. Note the difference between sodium as an element alone (left) and combined with chlorine to form a NaCl as a compound (right). 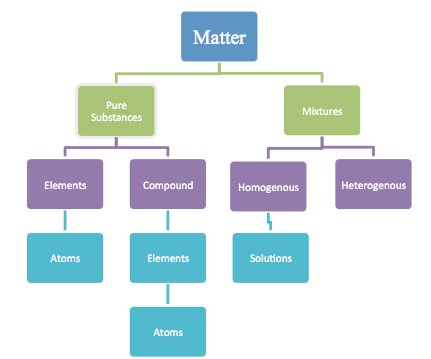 Mixtures: two or more pure substances that are physically—not chemically—combined, either evenly or unevenly. Mixtures can be separated into their components by physical means (evaporation, decanting, etc). Homogenous Mixture: an uniform blend of two or more substances such that all phases are combined evenly; a solution or uniform composition throughout. Heterogeneous Mixture: an un-uniform or varying composition of two or more substances such that all phases are NOT combined evenly and all phases are visible.